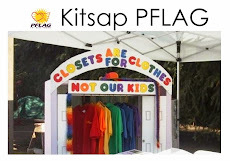 Kitsap PFLAG will be screening the film "Faces and Facets of Transgender Experience" at our meeting on Monday the 15th. This short documentary by the Boulder, CO PFLAG folks shares the stories of 18 transgender people and their families. It is a moving look at the issues that transgender people can face with their families and coworkers. Check out the link for more information about the film. We will start the film at 6:45 p.m. and then have a discussion afterwards (~ 7:15 p.m). The meeting is in our usual place - the library at Family of God Lutheran Church in East Bremerton. Everyone is welcome.